Whenever this minion takes damage, double its Attack. The Sen'jin High football team is The Gahz'rillas. she was the only legendary I got in the wild bundle. is she worth keeping? I don't play hunter TBH so I should probs just dust her. I don't regret crafting her at all. Such a fun card! Yeah, just don't play Volcano against this card. My friend and I decided to do an experiment to see how high we could get his Gahz'rilla with our normal decks. By the end it had over 100,000 attack and I couldn't see what it's health was because the attack stay covered it's health. 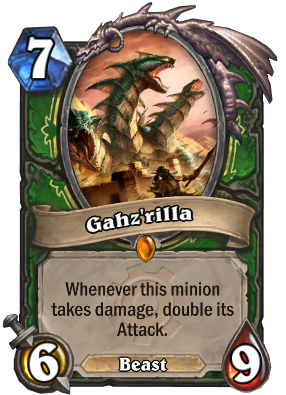 This card is perfect if your opponent needs to destroy one of your other minions because what Gazh'rilla does is put up another, likely larger threat that could easily spiral into the largest possible creature. Although this card is very fun and good, hunter doesn't have very many ways to help him grow. I think Gazh'rilla would be better if he were a Mage card. Hearthstone is consuming your time. I summened him in a tavernbrawl, then my enemy used Bouncing Blade, 3072 dmg!!! the insanity is real!! 1 dmg = a 12/8 Beast, 2 dmg = 24/7, 3 dmg = 48/6, 4 dmg = 96/5, 5 dmg = 192/4, 6 dmg = 384/3, 7 dmg = 768/2, 8 dmg = 1536/1 and 9 damage would kill it. So I call BS. You should be more careful with your math when you make up stories. Ah. Well, that's a fair point. isn't it possible that it was buffed to allow the math to be correct? Not really BS at all - he means it reached 3072 damage as it died (double 1536). He didn't actually specify that it survived the attack. The double attack effect triggers before the minion dies. So it becomes a 3072/0, then dies. I wonder how many people are going to keep replying to this with retorts without reading previous comments. 1 guy commented and I already said that it was a fair point, essentially admitting that my knee-jerk reaction wasn't fair. That and the fact that the replies keep duplicating what someone else just said. So, keep replying with stuff that's already been covered I guess.